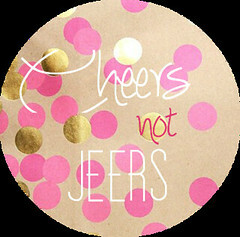 I'm once again linking up with Casey's awesome cheers not jeers link up. Is there anything better than spreading some love around the blogosphere (or anywhere really?). No. No there is not. Now I'm writing this post from the past. My friend Radiant Kristen posted this last week. If that picture doesn't bring a smile to your face, than I think you need a hot chocolate and a puppy cuddle ASAP. This picture made so incredibly happy before I even knew what her big news was. I was so happy that she is that happy. I think that is one of the biggest gifts that blogging has given me, with so many new friends sharing their stories, I get to share in their happiness. And it feels good, ya'll. But her big news is that she just got a promotion at work! CONGRATULATIONS Kristen. Krystina from By the Seat of My Shorts RAN HER FIRST MARATHON! It was her first marathon and I'm so awe-inspired and amazed by her dedication to run 26.2 miles. I hope that she stayed injury free, and as much as possible enjoyed the experience! Who are you sending some cheers and joy to today? Thank you so much! And way to go Krystina, it is an incredible thing to be able to run that far consecutively! Awesome! Promotions and marathon running! Talk about some endorphins up in this place!! I'm sending cheer and joy to... you Deidre. Hope you are having a good day and if not, I hope you are NOW that I've sent you cyber joy and cheer! Love both blogs and phew a marathon, thats AWESOME! "I'm once again linking up with Casey's awesome cheers not jeers link up. Is there anything better than spreading some love around the blogosphere (or anywhere really?). No. No there is not.". You just put this quote in my crazy head!! "I'm going to send you love and then I'm going to receive love. So here's me sending it, you get that? Alright, I'm ready to receive!" --Robert Downey Jr.